John Deere’s RUN 46 walk-behind mower has been awarded the coveted Best Buy status by consumer review body Which? The Which? Best Buy endorsement is given to products with high total test scores that perform consistently well in rigorous lab tests and excel in all key areas. The John Deere RUN 46 lawnmower achieved a score of 82%, the highest of all the Best Buy rated lawnmowers. The John Deere RUN 46 is a self-propelled, single-speed lawnmower with a steel deck and a 2.1kW Briggs & Stratton petrol engine. This proven four-stroke ReadyStart engine features an automatic choke system which means it always starts straight away, even on a cold day. Ideally suited for grass areas up to 1200m2, this lawnmower has a 46cm (18in) cutting width and easily adjustable height of cut from 32-72mm (1.5-3in). The handlebar height is adjustable for maximum comfort and it folds down for easy storage in confined spaces. The large capacity 52-litre collection bag makes collecting clippings simple. In addition the machine easily converts to a mulching mower with an optional kit. 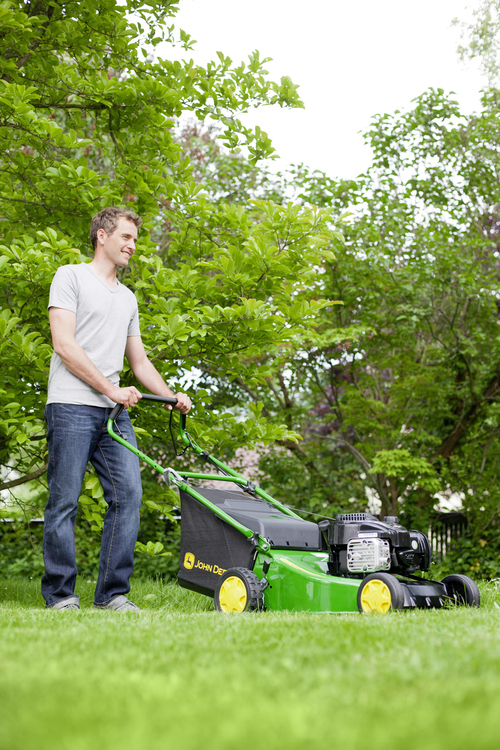 Designed to make mowing easy and convenient, the John Deere RUN 46 lawn mower costs £480 (including VAT) and is available from any John Deere homeowner dealer. Visit the website at www.JohnDeere.co.uk for details of the company’s complete lawn & garden equipment range; to find your nearest dealer look for the Dealer Locator link on the home page, or ring Freephone 0800 085 2522.